Mast cells produce proinflammatory cytokines in response to TLR4 ligands, but the signaling pathways involved are not fully described. In this study, the participation of the Src family kinase Fyn in the production of TNF after stimulation with LPS was evaluated using bone marrow–derived mast cells from wild-type and Fyn-deficient mice. Fyn−/− cells showed higher LPS-induced secretion of preformed and de novo–synthesized TNF. In both cell types, TNF colocalized with vesicle-associated membrane protein (VAMP)3-positive compartments. 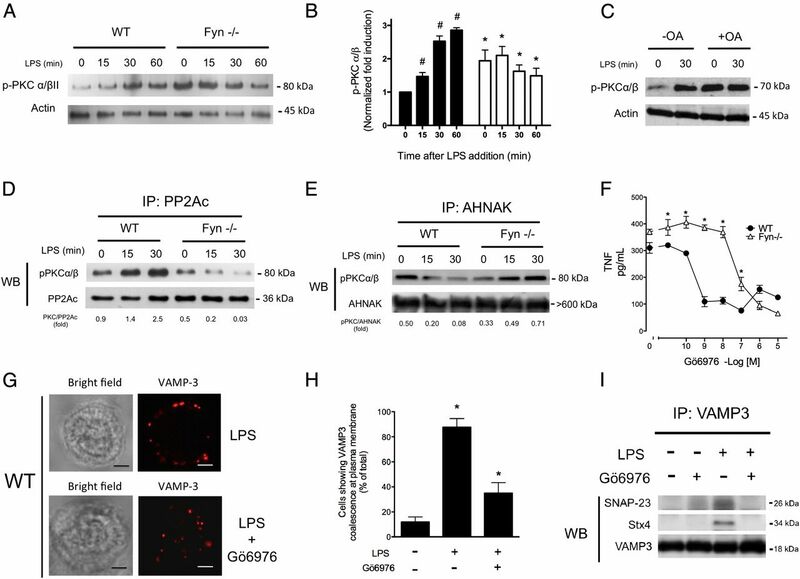 Addition of LPS provoked coalescence of VAMP3 and its interaction with synaptosomal-associated protein 23; those events were increased in the absence of Fyn. Higher TNF mRNA levels were also observed in Fyn-deficient cells as a result of increased transcription and greater mRNA stability after LPS treatment. Fyn−/− cells also showed higher LPS-induced activation of TAK-1 and ERK1/2, whereas IκB kinase and IκB were phosphorylated, even in basal conditions. Increased responsiveness in Fyn−/− cells was associated with a lower activity of protein phosphatase 2A (PP2A) and augmented activity of protein kinase C (PKC)α/β, which was dissociated from PP2A and increased its association with the adapter protein neuroblast differentiation–associated protein (AHNAK, desmoyokin). LPS-induced PKCα/β activity was associated with VAMP3 coalescence in WT and Fyn-deficient cells. Reconstitution of MC-deficient Wsh mice with Fyn−/− MCs produced greater LPS-dependent production of TNF in the peritoneal cavity. Our data show that Fyn kinase is activated after TLR4 triggering and exerts an important negative control on LPS-dependent TNF production in MCs controlling the inactivation of PP2Ac and activation of PKCα/β necessary for the secretion of TNF by VAMP3+ carriers. Mast cells (MCs) are important mediators of allergic reactions but also participate in the recognition of different pathogens, modulating innate and adaptive immune effector responses (1, 2). Depending on the nature and the intensity of the extracellular stimuli, MCs are able to secrete a diverse array of inflammatory mediators contributing to the initiation, maintenance, and resolution of inflammatory reactions (3). These mediators can be released from sources prestored within secretory granules, such as histamine, β-hexosaminidase, TNF, cathepsin D, and serotonin (4), or synthesized de novo after the activation of specific signaling cascades including a diverse array of cytokines and chemokines. MCs also express TLRs in their plasma membrane (15, 16). In particular, activation of TLR4 with bacterial LPS leads to cytokine production but not to anaphylactic degranulation (17). Notably, TLR4 signaling activated in MCs seems to exclusively depend on the function of the MyD88 adapter, because the expression of elements of the MyD88-independent pathway was not detected in bone marrow–derived MCs (BMMCs) (18, 19). The participation of Src family kinases in TLR4 signaling in immune cells was suggested (20), and Lyn kinase was shown to participate in the induction of cytokine synthesis after TLR4 triggering in monocytes (21) and MCs (22, 23). Anaphylactic degranulation after FcεRI triggering is associated with granule–granule and granule–plasma membrane fusion events that require the participation of soluble NSF attachment protein receptor (SNARE) proteins and are regulated by accessory proteins, such as Munc18 (24), Munc13, complexin, Rab, SCAMP, and synaptotagmin family members (25). One functional SNARE complex in MCs is formed by the vesicular SNARE vesicle-associated membrane protein (VAMP)8 and the two target SNAREs syntaxin (Stx)4 and synaptosomal-associated protein 23 (SNAP-23) (26, 27), mediating release from secretory granules (28). Other vesicle-SNAREs, such as VAMP3, also play a role in cytokine secretion after stimulation by ligands, such as IL-1β (28, 29). In human MCs, activation of TLR4 receptor induces piecemeal degranulation (30); in IgE-sensitized BMMCs, TLR4 triggering induces preformed TNF secretion in a process that requires activation of MAPK, intracellular calcium increase, and the IκB kinase (IKK)-dependent phosphorylation of SNAP-23 (31). Although the signaling pathways leading to regulated exocytosis triggered by FcεRI have been the subject of intense research in recent years, less information exists about the signal-transduction cascades coupling TLR4 activation to cytokine secretion in MCs. In particular, the participation of other Src family kinases (different from Lyn) in TNF secretion after LPS stimulation of MCs has not been fully analyzed. In the current study, we investigated the role of Fyn kinase on the signal-transduction system of TLR4 receptor in MCs. C57BL/6J and KitWsh/Wsh (Wsh) mice, stock numbers 000664 and 005051, respectively, were purchased from The Jackson Laboratory (Bar Harbor, ME). Mice were kept in normal conditions (12-h dark/light cycles) in sterile conditions at the Unit for the Production and Use of Laboratory Animals, Centro de Investigación y Estudios Avanzados del Instituto Politécnico Nacional (Cinvestav). All animal procedures were approved by the Cinvestav Institutional Ethics Committee (protocol 074-13). For Western blot and immunoprecipitation, the following Abs were used: anti–p-p70S6K (Thr 389), p-Src (Tyr 416), p-PKCα/βII (Thr 638/641), and p–TAK-1 (Thr 184–187) (all from Cell Signaling) and anti–p-ERK 1/2 (Tyr 204), p-IKKα/β (Ser 180–181), p-IκBα (Ser 32), CEBPδ, p65 NF-κB, PP2Ac α/β, pPP2Ac α/β (Tyr 307), neuroblast differentiation–associated protein (desmoyokin) (AHNAK), and TNF (all from Santa Cruz Biotechnology, Dallas, TX). LPS serotype 026:B6, monomeric IgE (clone SPE-7), actinomycin D (ActD), TAPI, okadaic acid (OA), Gö6976, anti-TLR4 N-terminal Ab, and reagents for agarose gels, immunoprecipitation, and Western blot were from Sigma-Aldrich (St. Louis, MO). Primary Abs against VAMP8, VAMP3, Stx4, and SNAP-23 used for Western blot and confocal microscopy were kindly provided by Dr. Ulrich Blank. For immunoprecipitation experiments, primary Abs against VAMP3 (Novus Biologicals, Littleton, CO), PP2A, or AHNAK (Santa Cruz Biotechnology) were used. Secondary Abs used were (H+L) HRP-coupled anti-rabbit (Jackson ImmunoResearch, West Grove, PA), anti-mouse (Zymed, San Francisco, CA) and anti-goat (Santa Cruz Biotechnology). BMMCs were produced from C57BL6/J mice, as described (31). Briefly, bone marrow was extracted from the tibias and femurs of mice and cultured in RPMI 1640 (Sigma-Aldrich) medium supplemented with IL-3 (10 ng/ml; PeproTech, Rocky Hill, NJ) and 10% FBS, 100 UI/ml penicillin, 100 μg/ml streptomycin, 50 μM 2-ME, and 1× nonessential amino acids (Invitrogen, Carlsbad, CA). Cultures were maintained for 4 wk, and media were changed every 5–7 d. Subsequently, BMMC differentiation was assessed by detecting the expression of the FcεRI receptor on plasma membrane by flow cytometry and evaluating the release of β-hexosaminidase after IgE/Ag stimulation (32). Only cultures 98% positive for FcεRI receptor expression and showing a dose response of β-hexosaminidase release after IgE/Ag addition were used in the study. For each experiment, BMMCs were sensitized with 100 ng/ml a monoclonal anti-DNP IgE (clone SPE-7; Sigma-Aldrich) for 24 h at 37°C, because this condition was shown to increase BMMCs’ responsiveness to LPS (31, 33). Routinely, after sensitization, cells were collected and resuspended in fresh culture medium or Tyrode’s BSA buffer (135 mM NaCl, 5 mM KCl, 1 mM MgCl2, 1.8 mM CaCl2, 5.6 mM glucose, 0.5 g/l BSA, and 20 mM HEPES [pH 7.4]) for Western blot or immunoprecipitation experiments. For cytokine secretion, sensitized cells were washed and resuspended in fresh media without IgE before the addition of LPS. One million wild-type (WT) and Fyn−/− BMMCs per condition were incubated with IgE (100 ng/ml) for 24 h. Cells were then collected and resuspended in blocking buffer 1× (BioGenex, San Ramon, CA) for 5 min at 4°C. Cells were washed twice and incubated with anti-TLR4 N-terminal Ab (1:200 in PBS 1×; Sigma-Aldrich) for 30 min at 4°C. Cells were washed and incubated with a PE-coupled anti-IgG Ab (1:200 in PBS 1×; Invitrogen, Grand Island, NY). After 30 min of incubation at 4°C, cells were washed again and resuspended in 4% paraformaldehyde; anti-isotype staining was performed in parallel. Samples were analyzed using a FACSort flow cytometer (BD Biosciences, San Jose, CA), and the graphs showing PE+ populations were generated using FlowJo 8.7. Two million IgE-sensitized WT and Fyn−/− BMMCs were collected and used for total RNA extraction and RT-PCR, as described (33). Briefly, total RNA was purified using TRI Reagent (Sigma-Aldrich) and suspended in 15 μl RNA secure solution (Ambion, Foster City, CA). The First Strand Synthesis Kit (Invitrogen, Waltham, MA) was used for cDNA synthesis, following the manufacturer’s instructions. Two microliters from each first-strand reaction were used to amplify TLR4, MD-2, CD14, and GAPDH cDNAs with the following primers: TLR4 sense 5′-GCAATGTCTGGCAGGTGTA-3′ and antisense 5′-CAAGGGATAAGAACGCTGAGA-3′ (34); MD-2 sense 5′-ATGTTGCCATTTATTCTCTTTTCGACG-3′ and antisense 5′-ATTGACATCACGGCGCTGAATGATG-3′ (35); and CD-14 sense 5′-CGTCTAGAAGAACACCATCGCTGTAAAG-3′ and antisense 5′-CGTCTAGAAGAACACCATCGCTGTAAAG-3′ (36). TNF primers were 5′-TTCTGTCTACTGAACTTCGGGGTGATCGGTCC-3′ (sense) and 5′-GTATGAGATAGCAAATCGGCTGACGGTGTGGG-3′ (antisense), and GAPDH primers were (sense) 5′-TGAAGGTCGGTGTGAACGGATTTGGC-3′ and (antisense) 5′-CATGTAGGCCATGAGGTCCACCAC-3′ (32). Conditions used for amplification were reported previously (32, 33), and the products were separated on 2% agarose gels with ethidium bromide dye. Activation of transcription after LPS stimulation of WT and Fyn−/− BMMCs was determined using a Multiplexed Transcription Factor Assay with a 50-plex probe panel from Marligen Biosciences (Ijamsville, MD). Nuclear protein extracts from nonstimulated BMMCS or BMMCs stimulated with LPS for 24 h were sent to the company, where the activity of specific transcription factors was determined. Transcription factors analyzed included HIF, NF-κB, PPAR, GATA, AR, EGR, CEBPδ, NFY1, HSF1, CRE-ATF, AP2, AP4, C-MYB, HNF1, HNF3, HNF4, TRE-AP1, SAF1, TAL1, SMAD 2-3, SMAD 1-5, Sterol, NHF1, CRE-ATF, STAT, Myc-Max, MTF1, NF1, NFAT, PBX, HFH3, ER, SRE, YY1, SP1, CEBPγ, and E2F6. IgE-sensitized BMMCs were suspended in fresh cell culture medium at a density of 3 × 106 cells/ml at 37°C. Then, cells were treated with 500 ng/ml LPS, and 1-ml aliquots were taken at different times after LPS addition. Each aliquot was centrifuged at 3000 × g at 4°C for 5 min. When necessary, supernatants were collected and kept at −80°C until use. Secreted TNF was quantified using a cytokine-specific ELISA kit from PeproTech, following the instructions provided. Two million BMMCs/condition were fixed with 2% glutaraldehyde for 1 h at room temperature (RT). Cells were washed three times with PBS and resuspended in 1% osmium tetroxide for 1 h. Samples were dehydrated with ethanol and embedded in Spurr resin. After polymerization, samples were cut into 70-nm slices and placed on a 200-mesh grid covered with Formvar film. Sections were contrasted with 2% uranyl acetate for 1 h and plumb acetate for 5 min. Slices were analyzed at 80 kV using a JEOL electron microscope (model JEM-1400). Two million cells/condition were placed on a poly-l-lysine–coated coverslip and fixed with 4% paraformaldehyde for 15 min at RT. Cells were placed in a bath of methanol for 7 min at −20°C and blocked for 2 h with a solution containing 3% BSA, 5% donkey serum, and 0.1% Tween 20. After washes, samples were incubated for 12 h in the presence of specific Abs diluted in blocking solution, and secondary Abs were added for 2 h at RT in a dark room. Secondary Abs used were Alexa Fluor 568 goat anti-mouse IgG (H+L), Alexa Fluor 488 F(ab′)2 fragment of goat anti-rabbit IgG (H+L), Alexa Fluor 555 donkey anti-rabbit IgG (H+L), and Alexa Fluor 488 donkey anti-goat IgG (H+L) (all from Life Technologies). When needed, DAPI (Life Sciences) was added to detect cell nuclei before the addition of the DABCO mounting media. Samples were analyzed with a Leica confocal microscope (model TCS SPE) equipped with a 63× immersion objective, and LAS AF Lite V 2.4.1 software was used for image acquisition and analysis. Thirty to fifty million IgE-sensitized BMMCs were suspended in a lysis buffer containing 1% Nonidet P-40 (IGEPAL), 20 μg/ml leupeptin, 10 μg/ml pepstatin, 10 μg/ml aprotinin, 1 mM sodium pyrophosphate, 1 mM orthovanadate, and 60 mM β-octylglucoside dissolved in PBS (pH 7.4). Lysates were cleared by centrifugation, and supernatants were kept frozen at −80°C until use. For routine immunoprecipitation assays, supernatants were quickly thawed and incubated overnight with 50 μl protein A–Sepharose beads loaded with 30 μg the corresponding primary Abs at 4°C. As negative control, IgG-loaded beads were used for immunoprecipitation. After immunoprecipitation, beads were carefully recovered by centrifugation and washed three times with 500 μl lysis buffer without β-octylglucoside. Beads were resuspended in 50 μl Laemmli buffer, boiled for 5 min, and centrifuged at low velocity for 5 min. Forty microliters of each sample was separated in a 10% acrylamide gel, and proteins were transferred to a polyvinylidene difluoride membrane. Subsequently, the membrane was processed as described in the Western blot section. For immunoprecipitation of SNARE complexes, the reported protocol with an N-ethylmaleimide treatment was used (26, 29). For lipid raft preparation, detergent-resistant membranes (DRMs) and non-DRMs were isolated as described previously (37), with some modifications (38). In brief, 4 × 106 BMMCs were harvested with 1.5 ml TNTE buffer (20 mM Tris-HCl [pH 7.4], 150 mM NaCl, 1 mM EDTA, 1% Triton X-100, plus protease and phosphatase inhibitors) and passed five times through a 25-gauge needle. Cell lysates were adjusted to 45% final concentration of sucrose (4 ml) and ultracentrifuged through a discontinuous sucrose gradient, which was formed by sequentially layering 35% sucrose (4 ml) and 5% sucrose (4 ml), at 38,000 rpm for 20 h in a Beckman SW40Ti rotor at 4°C. Twelve fractions of 1 ml were harvested from the top of the gradient. Each fraction was solubilized with 1% n-Octylglucoside for 1 h at 4°C; from solubilized fractions, 300 μl was precipitated with methanol/chloroform and loaded in a final volume of 30 μl Laemmli 2×/well on a 12.5% SDS-polyacrylamide gel. Flotillin-2 (detected with a Santa Cruz Biotechnology B-6 Ab) was used as a lipid raft–associated marker in Western blots. Two million IgE-sensitized BMMCs were suspended in 1 ml Tyrode BSA buffer and stimulated with LPS (500 ng/ml). At specific times after stimulation, cells were collected by centrifugation and lysed by the addition of 100 μl 1× Laemmli buffer (Sigma-Aldrich) supplemented with 6 mM sodium orthovanadate. Lysates were boiled for 15 min before electrophoresis (see Western blot section). Proteins from total lysates, immunoprecipitation, or DRM fractionation were separated by denaturing 10–15% acrylamide gels and transferred onto polyvinylidene difluoride membranes (Perkin Elmer, Akron, OH). Membranes were blocked with 6% nonfat milk for 1 h in TBST buffer and washed once with TBST before the addition of primary Abs, which were used at 1:1000 dilutions overnight. After several washes with TBST, blots were incubated with the appropriate dilutions of secondary Abs. Western blots were developed using Immobilon Western Chemiluminescent HRP substrate (Millipore). PP2A activity was determined with the Serine/Threonine Phosphatase Assay System (Promega), using the buffers, columns, substrate, and instructions supplied by the manufacturer. Briefly, a protein extract was prepared with 2 million IgE-sensitized BMMCs resuspended in provided lysis buffer and kept on ice for 15 min. Lysates were centrifuged for 15 min at 20,000 × g to discard nuclei. Supernatants were placed on a Sephadex G-25 (QIAGEN, Germantown, MD) to remove free phosphate. Proteins in column eluates were quantified using the Bio-Rad Protein Assay (Bio-Rad, Hercules, CA). Equal amounts of proteins from WT and Fyn−/− cells were used to determine the release of free inorganic phosphate (iP) from the specific phosphopeptide provided in the kit. MC-deficient Wsh mice were reconstituted with mature BMMCs, as reported (39, 40). Briefly, 8-wk-old male Wsh mice were injected in the peritoneum with 2 million FcεRI+ BMMCs, cultured as described in earlier sections. Four weeks later, animals were used for the determination of early i.p. TNF production after LPS administration (see below). WT C57BL6/J, MC-deficient Wsh mice, or Wsh mice reconstituted with WT or Fyn−/− BMMCs received an i.p. administration of LPS (1 mg/kg). One hour later, animals were sacrificed by CO2 inhalation, and peritoneal washes were obtained as described (40). TNF concentration in peritoneal washes was determined by ELISA. Data are expressed as mean ± SEM. Data were analyzed using one- or two-way ANOVA and the Student–Newman–Keuls multiple comparison as a post hoc test. Although the participation of Src family kinases was reported in the TLR4 signal-transduction system, it was not known whether Fyn kinase becomes activated in response to LPS stimulation in MCs. In a first set of experiments, we determined whether Fyn becomes activated after exposure of WT BMMCs to LPS. Cells from WT animals were stimulated with LPS, and Fyn kinase was immunoprecipitated. Fyn activation was detected by Western blot using an Ab able to recognize the activation tyrosine residue conserved on all Src family kinases. As seen in Fig. 1A, LPS caused a significant increase (∼2.5 fold) in Fyn phosphorylation on the regulatory tyrosine located within its catalytic domain. To further analyze the role of Fyn in TLR4 signaling, we used BMMCs derived from Fyn−/− and WT mice and compared some important functional responses. We first analyzed expression levels of crucial surface molecules in using either flow cytometry (TLR4) or RT-PCR (TLR4, CD14, and MD2). Fig. 1B shows that no difference in the expression of TLR4 or accessory molecules was detected between WT and Fyn−/− BMMCs. To analyze whether morphologic differences exist between the two cell types, BMMCs were subjected to electron microscopy analysis (Fig. 1C, left panels). WT and Fyn−/− cells showed multiple electrodense granules, and no significant differences in cell size or number of granules were detected (Fig. 1C, right panels). Fyn kinase is activated after TLR4 receptor triggering in MCs and negatively regulates TNF production in response to LPS. (A) Two million BMMCs derived from WT mice were sensitized overnight with 100 ng/ml IgE and stimulated with 500 ng/ml LPS for specific times. Fyn kinase was immunoprecipitated, and its phosphorylation was detected with an Ab against the conserved p-Tyr 417 of Src kinase. A representative blot and the densitometric analysis of three or four blots are shown. (B) WT and Fyn−/− BMMCs were incubated with FITC-labeled Abs against TLR4 receptor and analyzed by flow cytometry. Total RNA was extracted, and mRNA expression of TLR4, CD-14, MD-2, and GAPDH was detected by RT-PCR (inset). (C) IgE-sensitized WT and Fyn−/− cells were processed and subjected to transmission electron microscopy. Representative images from ≥10 cells analyzed for each condition are shown. Scale bars, 2 μm. Cell size (diameter) and granule number analyses were performed by measuring ≥70 cells of each genotype. (D) Two million WT and Fyn−/− BMMCs were stimulated with LPS (500 ng/ml), and TNF was quantified by ELISA on cell supernatants at different times. Data are mean ± SEM of five independent experiments. *p < 0.005 versus WT. (E) BMMCs were preincubated with vehicle or ActD (5 μg/ml) for 15 min. Subsequently, cells were stimulated with LPS (500 ng/ml), and TNF concentration in the supernatant was determined at different times after LPS addition by ELISA. *p < 0.005 versus nontreated cells (n = 5). (F) TNF concentrations in supernatants from nonstimulated cells and cells that were treated with LPS for 2 h (from E) (upper panel). Two million WT and Fyn−/− BMMCs were treated with LPS for 0 or 24 h, and cellular pellets were collected. Pellets were lysed, and TNF content was determined by ELISA. *p < 0.005 versus nontreated cells (n = 5), #p < 0.005 versus WT cells under the same condition. To analyze the role of Fyn in LPS-induced TNF production, BMMCs were treated with LPS (500 ng/ml), and the concentration of that cytokine in the supernatant was analyzed in time-course experiments. Fig. 1D shows that no differences were observed in basal levels (71 ± 12 pg/ml in WT and 68 ± 17 pg/ml in Fyn−/− cells), and both cell types were able to produce significant amounts of TNF as early as 30 min after LPS addition (140 ± 14 pg/ml in WT and 203 ± 9 pg/ml in Fyn−/−). However, Fyn−/− BMMCs secreted significantly higher levels of TNF than did WT BMMCs at all time points. We next analyzed the effect of the transcription inhibitor ActD on LPS-induced TNF secretion. Fig. 1E shows that, in the presence of ActD, LPS-induced TNF accumulation in WT was arrested at ∼2 h after LPS addition, indicating the existence of transcription-independent pools released early after stimulation. In the absence of ActD, the release of TNF in WT cells continued up to 24 h after TLR4 triggering, suggesting long-term RNA transcription and synthesis of TNF stimulated by LPS in that cell type. In contrast, the full blockage of TNF secretion by ActD was observable after 4 h in Fyn−/− BMMCs and, without ActD, TNF production reached higher values than that observed in WT cells. Fig. 1F (upper panel) shows the values of TNF in the supernatant of WT and Fyn−/− cells, treated or not with ActD, at 0 or 2 h after LPS addition. Although no difference was detected in the basal levels of TNF secretion, Fyn−/− BMMCs secreted significantly larger amounts of preformed TNF after stimulation with LPS. The amount in cellular pellets was not significantly higher in nontreated Fyn-deficient cells (568 ± 41 pg/million cells) than in WT cells (406 ± 32 pg/million cells) (Fig. 1F, lower panel), whereas intracellular TNF content after 24 h of LPS treatment was significantly higher in Fyn−/− cells than in WT BMMCs. Together, these results suggested that, without an important effect on basal TNF synthesis or secretion, the absence of Fyn leads to a greater exocytosis of prestored and de novo–synthesized TNF in response to TLR4 receptor activation. Using the protease inhibitor TAPI (which inhibits cleavage of the membrane-bound form of TNF), recent experiments showed that TNF is located in VAMP3+ compartments in MCs (28). To analyze whether the absence of Fyn had any impact on the described localization of TNF, we performed confocal analysis. As shown in Fig. 2A, the localization of TNF in VAMP3+ compartments was corroborated under the same experimental conditions used in previous reports, and no difference in TNF localization was found between WT and Fyn−/− cells. Because cytokine secretion is associated with translocation of vesicle-SNARE to plasma membrane (25), we next examined whether any changes occur in VAMP3 localization in response to LPS in WT and Fyn−/− BMMCs. Fig. 2B (upper panels) shows confocal images of VAMP3+ vesicular structures 30 min after vehicle or LPS addition. In vehicle-treated cells, VAMP3 was primarily localized in vesicles throughout the cytosol. Importantly, 30 min after LPS treatment, VAMP3+ vesicles appeared to coalesce and formed larger aggregates that were located close to the plasma membrane. As a control, changes in localization of VAMP8 were also tracked. VAMP8+ vesicles were also primarily present in the cytoplasm of both cell types; however, this localization did not change significantly after 30 min of TLR4 triggering (Fig. 2B, lower panels). It is important to mention that no apparent differences in the amount of immunostained VAMP8 or VAMP3 were detected between WT and Fyn−/− BMMCs by confocal microscopy, and this was corroborated by Western blot (data not shown). The formation of VAMP3-containing aggregates after LPS addition was observed in >70% of WT cells and >85% of Fyn−/− cells (Fig. 2C). To achieve a closer look at the apparent size of VAMP3 aggregates found in plasma membrane, we performed a fluorescence-intensity profile of a representative membrane section from cells shown in Fig. 2B. To do so, a straight line was drawn on a section of plasma membrane of cells, using the toolbox of the microscope LAS software, to quantify fluorescence intensity (see Materials and Methods) (Fig. 2D). Then, arbitrary units of fluorescence on the line were obtained and plotted. Fig. 2D (upper panels) shows the VAMP3 fluorescence-intensity profile on a membrane section of WT cells treated with vehicle (WT+Veh) or LPS (WT-LPS). Although a certain amount of signal is obtained without stimulation, the number of points along the line for which the intensity of fluorescence increased was greater after LPS addition. In contrast, the number of points and the intensity of fluorescence along the line traced on Fyn−/− cell membrane were slightly higher than WT in basal conditions and increased significantly after stimulation with LPS (Fig. 2D, lower panels). Because it was shown that VAMP3 can interact with SNAP-23 in MCs after stimulation (29), we decided to immunoprecipitate VAMP3 and analyze its association with SNAP-23 in vehicle- or LPS-treated WT and Fyn−/− cells. Additionally, the presence of Stx4 on VAMP3 immunoprecipitates was evaluated. As shown in Fig. 2E, a basal association of VAMP3 with SNAP-23 and Stx4 was not observable in any of the cell types; however, that association was detected after LPS addition. The amount of SNAP-23 and Stx4 associated with VAMP3 after stimulation with LPS was significantly higher in the absence of Fyn. TNF colocalizes with VAMP3+ compartments, and LPS stimulation leads to VAMP3 coalescence that is more evident in the absence of Fyn. (A) BMMCs from WT or Fyn−/− mice were treated with TAPI (5 μM) for 3 h, and cells were fixed and processed for confocal microscopy using anti-VAMP3– and anti-TNF–specific Abs. A representative image from ≥10 cells analyzed for each condition is shown. Scale bars, 2 μm. (B) WT and Fyn−/− BMMCs were incubated with vehicle or LPS (500 ng/ml) for 30 min, and cells were fixed and processed for confocal microscopy to detect VAMP3 or VAMP8. A representative image of ≥10 cells analyzed for each condition is shown. Scale bars, 2 μm. (C) WT and Fyn−/− BMMCs were treated and processed as in (B). The percentage of cells showing VAMP3 or VAMP8 coalescence was determined by analyzing 10 fields containing ≥10 cells each. Data are mean ± SEM of three independent experiments performed with different cell cultures. (D) Intensity fluorescence profiles obtained on selected areas of cells included in (B) are shown. Similar profiles were obtained from at least two sections of 10 independent cells (see text for details). (E) Forty million WT and Fyn−/− cells were treated with vehicle or LPS (500 ng/ml) for 30 min and were lysed to immunoprecipitate VAMP3. The presence of SNAP-23 and Stx4 in VAMP3 immunoprecipitates was analyzed by Western blot. A representative image and densitometric analysis of at least three independent experiments are shown. (F) WT and Fyn−/− BMMCs were stimulated with vehicle or LPS (500 ng/ml) for 30 min, and DRMs (lipid rafts) were fractionated by sucrose gradients. SNARE proteins in representative fractions were detected by Western blot. Detection of flotillin was included as a control. A representative image of at least three independent experiments is shown. *p < 0.005 versus nontreated cells (n = 3), #p < 0.005 versus WT cells under the same conditions. WCL, whole-cell lysate. Because VAMP3 relocalization to lipid rafts after LPS treatment was described in macrophages (41), we decided to analyze whether VAMP3 aggregates observed in BMMCs could occur on the same membrane structures. Fig. 2F shows the detection of VAMP8, VAMP3, Stx4, and SNAP-23 in lipid raft (DRM) fractions of WT and Fyn−/− BMMCs treated with vehicle or LPS. Although a significant amount of SNAP-23 was found in DRMs in both cell types, stimulation with LPS (for 30 min) did not cause a detectable redistribution of any of the SNARE proteins to DRMs. Next, the intracellular signaling pathways leading to LPS-induced de novo synthesis of TNF were investigated. Fig. 3A shows semiquantitative RT-PCR mRNA analysis of TNF in WT and Fyn−/− BMMCs stimulated with LPS. A slight increase in TNF mRNA was observed in resting Fyn−/− cells compared with WT cells. Interestingly, stimulation with LPS induced a larger increase in TNF mRNA in Fyn-deficient cells compared with WT cells. Because it was reported that TNF mRNA accumulation depends on de novo transcription, as well as on the binding of mRNA-stabilizing proteins (42) able to extend mRNA half-life, we analyzed the potential changes in TNF mRNA half-life after LPS addition in both cell types. Fig. 3B shows that TNF mRNA half-life after TLR4 stimulation was close to 1.2 h in WT cells, but it was close to 6 h in Fyn-deficient cells. Together, the results suggest that Fyn kinase negatively controls TNF mRNA stabilization in response to LPS. Increased activity of the MyD88-dependent signaling pathway in Fyn−/− BMMCs. (A) Two million WT and Fyn−/− BMMCs were stimulated with LPS (500 ng/ml) for different times, and total RNA was isolated for RT-PCR to amplify TNF mRNA. A representative image and densitometric analysis of at least three independent experiments are shown. *p < 0.005 versus nontreated cells (n = 3), #p < 0.005 versus WT cells under the same conditions. (B) Cells were stimulated for 2 h with LPS, and ActD (10 μg/ml) was added to the medium. Total RNA was isolated at different times after ActD addition, and remaining TNF mRNA was detected by RT-PCR. A representative image of the agarose gel and densitometric analysis of three independent experiments are shown. (C) WT and Fyn−/− BMMCs were stimulated with LPS (500 ng/ml) for the indicated times before being lysed. Phosphorylation of representative proteins of the MyD88-dependent signaling pathway was detected by Western blot. (D) Quantification of representative blots of at least three independent experiments shown in (B). *p < 0.005 versus WT cells under similar conditions, #p < 0.005 versus nonstimulated cells with the same phenotype, n = 3. We then analyzed the phosphorylation of key proteins in the TLR4-signal transduction system. Fig. 3C shows a representative experiment, and Fig. 3D shows quantitative analysis of at least three independent experiments for each protein. We found that basal phosphorylation of TAK1, ERK1/2, IKK, and IκB was higher in Fyn−/− cells than in WT cells. After stimulation with LPS, phosphorylation of TAK1 reached higher values in Fyn-deficient cells than in WT cells, ERK1/2 was phosphorylated to the same levels observable in LPS-stimulated WT cells, and IKK or IκB did not change significantly in Fyn−/− cells. To evaluate whether the increased phosphorylation of proteins observed in Fyn-deficient cells was associated with higher activity of transcription factors, we analyzed the LPS-induced translocation of specific transcription factors using a multiplex assay. WT and Fyn−/− cells were stimulated for 1 h with LPS, and nuclear extracts were obtained. Binding of transcription factors to specific sequences was determined using a Multiplex Transcription Factor Assay with a 50-plex probe panel (Marligen Biosciences) (see Materials and Methods). As shown in Table I, LPS addition induced increased binding of a number of canonical transcription factors, such as NF-κB, CEBPδ, EGR, and NF1, in WT cells. Remarkably, high basal nuclear translocation of IKK-dependent transcription factors, such as NF-κB and CEBPδ, was observed in Fyn-deficient cells, and no significant increase was detected after LPS addition. Observations for NF-κB and CEBPδ were confirmed by confocal microscopy (Supplemental Fig. 1). To further analyze the intracellular pathways that could be responsible for the pleiotropic increased response to LPS observed in Fyn-deficient cells, we tested the hypothesis that the activation of a crucial signal-limiting phosphatase could be altered in BMMCs derived from Fyn−/− mice. Among the phosphatases reported to control mediator secretion in MCs and to downregulate NF-κB activation after TLR4 triggering, we focused on PP2A (42, 43). First, we used a pharmacological approach to evaluate whether PP2A could play a negative role in LPS-induced TNF secretion. BMMCs from WT mice were treated with different concentrations of the phosphatase inhibitor OA before the addition of LPS, and TNF in cell supernatants was quantified 2 h after stimulation. Fig. 4A shows that, although preincubation of cells with high (1 μM) OA concentrations prevented LPS-induced TNF secretion, lower concentrations (in the nanomolar and picomolar range) had the opposite effect, increasing the amount of secreted TNF (from 285 ± 40 pg/ml with LPS alone to 490 ± 66 pg/ml with LPS+0.1 nM OA). Next, to explore the potential relationship between Fyn deficiency and PP2A function, we determined the enzymatic activity of PP2A in BMMCs from WT and Fyn−/− mice. As shown in Fig. 4B, basal activity of PP2A cells was significantly lower (47 ± 11 pmol iP/min/mg protein) in Fyn-deficient cells compared with WT cells (115 ± 9 pmol iP/min/mg protein). Decreased PP2A activity related to Tyr phosphorylation contributes to the hyperresponse to LPS observed in Fyn−/− BMMCs. (A) Two million WT BMMCs were incubated with specific concentrations of OA for 15 min and then treated with LPS (500 ng/ml) for 2 h. TNF concentration was detected on cellular supernatants by ELISA. Mean ± SEM of at least three independent experiments is shown. (B) Ten million WT or Fyn−/− BMMCs were lysed, and the activity of PP2A was determined as described in Materials and Methods. Data are mean ± SEM of at least three independent experiments. (C) Thirty million WT or Fyn−/− BMMCs were stimulated with LPS (500 ng/ml) for specific times, and the catalytic subunit of PP2A (PP2Ac) was immunoprecipitated. Phosphorylation on Tyr 307 of PP2Ac was detected by Western blot. (D) WT and Fyn−/− BMMCs were stimulated with LPS for different times, and phosphorylation of specific substrates of PP2A was analyzed by Western blot. (E) PP2Ac was immunoprecipitated from WT BMMCs stimulated for 30 min with LPS in the presence or absence of PP2 (10 μM). Phosphorylation of PP2Ac (Tyr 307) was detected by Western blot. (F) WT or Fyn−/− BMMCs were stimulated with LPS for specific times, and PP2Ac was immunoprecipitated from total lysates. Lyn kinase was detected in immunoprecipitates by Western blot. Representative images from at least three independent experiments are shown (C–F). *p ≤ 0.001 versus WT. Inhibition of PP2A activity was related to the phosphorylation of a regulatory Tyr 307 residue (44) located within the catalytic subunit (PP2Ac) of that protein. To examine whether the reduced phosphatase activity in Fyn-deficient BMMCs could be related to that posttranslational modification, PP2Ac was immunoprecipitated from cellular lysates of WT and Fyn−/− BMMCs, and Western blot was performed using an anti–p-PP2Ac (Tyr 307)-specific Ab. Fig. 4C shows that LPS treatment induced a time-dependent increase in phosphorylation of PP2Ac (Tyr 307) in WT cells. When samples from Fyn-deficient cells were analyzed, increased levels of basal Tyr phosphorylation were observed, and no further increase was detected after LPS treatment. Because PP2A was shown to dephosphorylate a number of intracellular substrates regulating proinflammatory signaling pathways in immune cells, we reasoned that a decrease in its activity should lead to elevated phosphorylation of a range of proteins involved in specific aspects of cytokine production and exocytosis. Therefore, we evaluated phosphorylation of well-identified substrates of PP2A in response to TLR4 activation, such as p70S6K and CamKII. Fig. 4D shows that p70S6K and CamKII were highly phosphorylated under basal conditions in Fyn-deficient BMMCs compared with WT cells, and this phosphorylation did not increase after LPS treatment. An inhibitory effect of Tyr 307 PP2Ac phosphorylation caused by Src family kinases was reported in specific cell types (45, 46). After the detection of PP2Ac phosphorylation, we evaluated whether such a scenario could apply to TLR4-triggered MCs. First, a pharmacological approach was used; BMMCs from WT mice were treated with the Src family kinase inhibitor PP2 (10 μM) or vehicle before stimulation with LPS (500 ng/ml). Fig. 4E shows that PP2 pretreatment blocked the LPS-dependent phosphorylation of Tyr 307 of PP2Ac. In some experiments, a slight increase in basal phosphorylation of PP2Ac was detected in the presence of PP2, although this effect was not statistically different from nonpretreated/nonstimulated cells (data not shown). To identify the Src family kinase responsible for phosphorylation of PP2Ac after TLR4 triggering, PP2Ac was immunoprecipitated from WT and Fyn−/− BMMCs after LPS addition, and associated kinases were analyzed by Western blot. Of the Src kinases tested (Fgr, Hck, and Lyn), only Lyn was associated with PP2Ac in WT cells; importantly, this interaction was increased in Fyn−/− cells (Fig. 4F). In addition to p70S6K and CamKII, dephosphorylation and inactivation of classical isoforms of PKC (PKCα/β) were shown to rely on PP2A (46). Acting upstream of IKK, these isoforms of PKC were associated with the secretion of proinflammatory cytokines in MCs stimulated through the FcεRI (47) and bone marrow–derived neutrophils stimulated with TLR ligands (48). Also, PP2A-induced dephosphorylation of PKCα/β was reported in BMMCs exposed to bacteria (49). With the aim to connect the observed diminished activity of PP2A in Fyn−/− cells with the increased secretion of TNF after LPS addition, we asked whether PKCα/β could be more active in Fyn−/− BMMCs as a consequence of lower PP2Ac activity. As can be seen in Fig. 5A and 5B, phosphorylation of classical isoforms of PKC was, as expected, higher in cells deficient in Fyn kinase and, in contrast to WT BMMCs, no further increase was observed in the absence of Fyn. To determine whether PP2A could be responsible for dephosphorylation of these isoforms of PKC in LPS-treated BMMCs, WT cells were incubated with vehicle or OA and then stimulated with LPS. After 30 min, cells were lysed, and phosphorylation of PKCα/β was analyzed by Western blot. Fig. 5C shows that LPS-induced phosphorylation of PKCα/β was increased in vehicle-treated cells, but the phosphorylation was even higher in cells pretreated with OA. When PP2Ac was immunoprecipitated from LPS-treated BMMCs, a time-dependent association of PP2A and PKCα/β was observed in WT BMMCs (Fig. 5D), but not in Fyn−/− BMMCs, in which a dissociation of PP2A from PKCα/β was detected. Because PKCα/β activity can be modulated by its phosphorylation state, as well as by its cell localization (50) and association with specific adapters (51), we decided to explore whether Fyn could modulate the interaction between PP2A and PKCα/β, as well as the association of PKCα/β with proteins that could increase its activity. In this regard, the role of the adapter protein AHNAK (desmoyokin) in the increase in PKC activity as a result of its dissociation from PP2A was described (52). We decided to explore whether LPS-induced triggering of TLR4 in BMMCs could lead to an association between AHNAK and PKCα/β and whether this could be altered in Fyn-deficient cells. Fig. 5E shows that the association between phosphorylated PKCα/β and AHNAK in WT cells decreased in a time-dependent fashion after LPS addition. Interestingly, the association between p-PKCα/β and AHNAK in Fyn−/− cells increased rapidly upon TLR4 stimulation. The PP2Ac–PKCα/β axis controls the LPS-induced secretion of TNF modulating VAMP3 translocation to the plasma membrane. (A) Two million WT and Fyn−/− BMMCs were treated with LPS (500 ng/ml) for different times and lysed to detect PKCα/β phosphorylation by Western blot. (B) Blots of three independent experiments in (A) were subjected to densitometric analysis. *p < 0.05 versus WT cells under the same conditions, #p < 0.05 versus nonstimulated cells. (C) WT BMMCs were incubated with 0.1 nM OA for 15 min and treated with LPS for 30 min. Cells were lysed, and phosphorylation of PKCα/β was detected by Western blot. (D) WT or Fyn−/− BMMCs were stimulated with LPS (500 ng/ml), and PP2Ac was immunoprecipitated from lysates. Coimmunoprecipitated PKCα/β was detected by Western blot. (E) BMMCs were stimulated with LPS as in (D), and AHNAK was immunoprecipitated from lysates. Coimmunoprecipitated PKCα/β was detected by Western blot. (F) WT and Fyn−/− BMMCs were treated with different concentrations of Gö6976 for 15 min and stimulated with LPS (500 ng/ml). After 2 h, supernatants were collected, and TNF concentration was detected by ELISA. *p < 0.001 versus WT cells. (G) BMMCs from WT mice were treated with vehicle or 1 μM Gö6976 for 15 min, and cells were stimulated with LPS for 30 min, fixed, and subjected to confocal microscopy to detect VAMP3. Scale bars, 2 μm. Representative images of at least five analyzed cells are shown. (H) The percentage of cells showing VAMP3 coalescence after the treatments in (G) was determined by analyzing 10 fields containing ≥10 cells in each preparation. Data are mean ± SEM of three independent experiments performed with different cell cultures. *p < 0.005 versus nontreated cells (n = 3). (I) WT BMMCs (40 million/lane) were treated with vehicle or Gö6976 (1 μM) for 15 min and stimulated with LPS for 30 min. Cells were lysed, and VAMP3 was immunoprecipitated, as described in the Materials and Methods. The presence of SNAP-23 and Stx4 on VAMP3 immunoprecipitates was evaluated by Western blot. Representative blots of three independent experiments with cells from different cultures are shown in (A), (C)–(E), and (I). To investigate the connection between PKCα/β activity and TLR4-dependent secretion of TNF in BMMCs, cells from WT animals were treated with compound Gö6976 (a specific inhibitor of PKCα/β) before stimulation with LPS. Fig. 5F shows that such pretreatment prevented LPS-triggered TNF secretion in BMMCs within the nanomolar range of concentrations. Consistent with the strong association observed between PKC and AHNAK in Fyn−/− cells (suggesting higher PKC activity), secretion of TNF in Fyn-deficient cells was less sensitive to the Gö6976 compound. To investigate the participation of classical isoforms of PKC in LPS-induced secretion of TNF in MCs, we evaluated whether the Gö6976 compound could also block the LPS-induced coalescence of VAMP3-containing vesicles that was observed previously. Fig. 5G and 5H show that preincubation of WT BMMCs with Gö6976 inhibited the LPS-induced coalescence and translocation of VAMP3 compartments to plasma membrane. Finally, we decided to analyze whether PKCα/β activation is involved in the LPS-induced interaction among VAMP3, Stx4, and SNAP-23. Fig. 5I shows that preincubation of WT cells with Gö6976 prevented the formation of the observed VAMP3/Stx4/SNAP-23 complex after LPS addition. TLR4-induced TNF secretion by MCs is crucial for survival after i.p. bacterial infection in mice (53). To analyze whether the negative-regulatory role of Fyn kinase in the LPS-induced TNF secretion in MCs could be relevant in vivo, we used a well-described murine model of endotoxemia (54). WT, Fyn−/−, Wsh, Wsh mice reconstituted with BMMCs derived from WT animals (WshRecWT mice), and Wsh mice reconstituted with BMMCs derived from Fyn−/− animals (WshRecFyn−/− mice) were treated with an i.p. injection of LPS (1 mg/kg), and TNF concentration in peritoneal lavages was determined 1 h later. Fig. 6 shows that i.p. administration of LPS induced the expected increase in TNF in WT mice (from 80 ± 19 pg/ml to 338 ± 36 pg/ml), and this increase was significantly higher in Fyn-deficient mice (from 105 ± 12 pg/ml to 472 ± 21 pg/ml). As reported earlier (40, 55), Wsh animals exhibited normal basal levels of TNF in the peritoneal cavity, and the administration of LPS did not produce any significant changes. 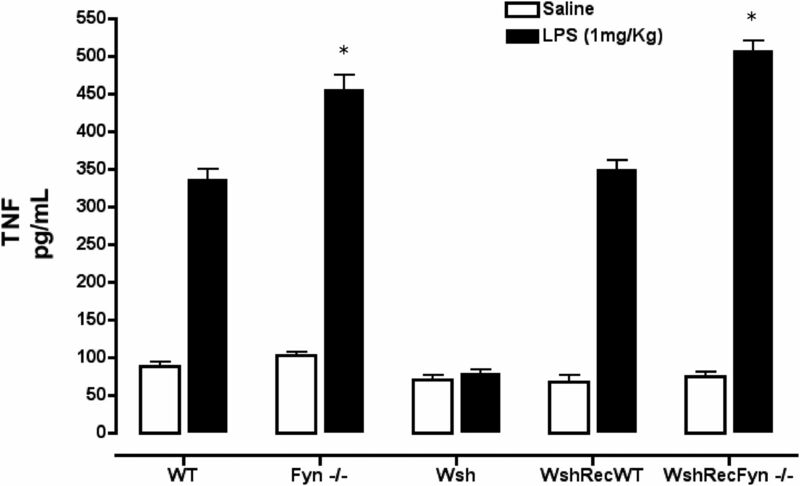 Normal levels of LPS-induced TNF were observed in WshRecWT mice; however, significantly higher amounts of TNF were detected in WshRecFyn−/− mice. Together, in vitro and in vivo results place Fyn kinase as an important negative regulator of TLR4 signaling in BMMC (Fig. 7). Fyn kinase negatively controls MC-dependent, LPS-induced TNF secretion in the peritoneal cavity of mice. WT, Fyn−/−, Wsh, WshRecWT, and WshRecFyn−/− mice received an i.p. injection of saline solution or LPS (1 mg/kg) in 200 μl final volume. One hour later, mice were euthanized by CO2 inhalation, and peritoneal washes were obtained. TNF concentration was determined by ELISA. *p < 0.001 versus WT animals treated with LPS (n = 10). Regulatory function of Fyn kinase in early events leading to LPS-induced TNF production in MCs. After TLR4 triggering, the Src family kinases Lyn and Fyn are activated and regulate the function of downstream effectors, leading to secretion and de novo synthesis of TNF. 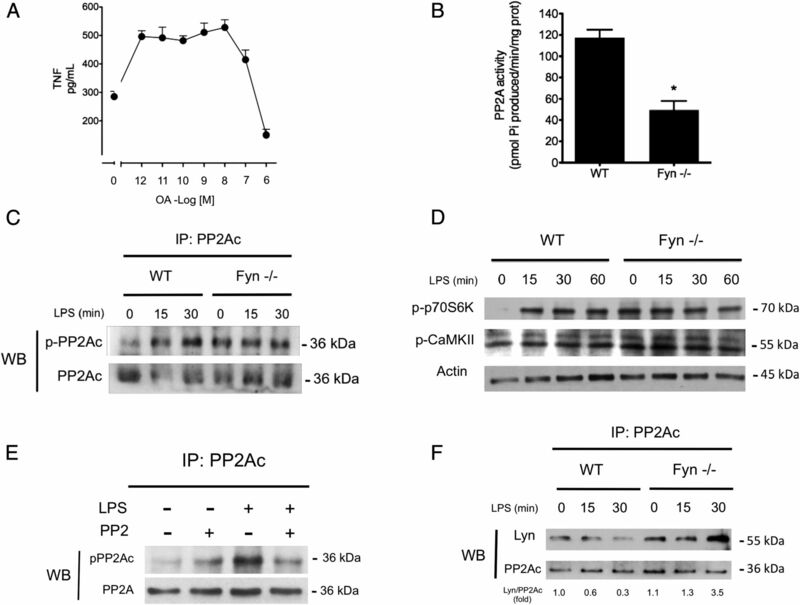 In the absence of Fyn, TLR4 triggering causes Lyn-dependent phosphorylation and inactivation of PP2Ac, favoring the association of p-PKCα/β with the adapter protein AHNAK. In turn, active PKC contributes to preformed TNF secretion through VAMP3+ carriers. 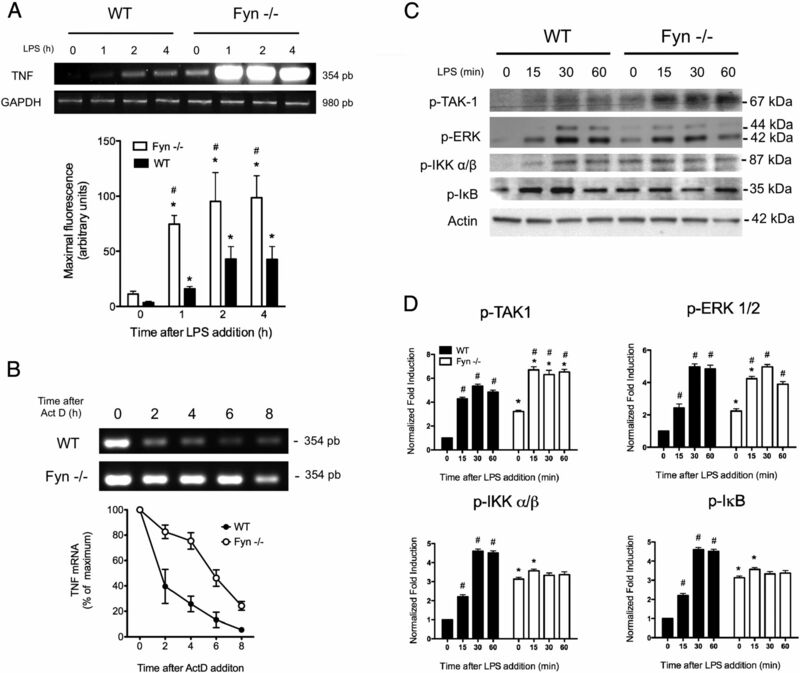 Ablation of Fyn kinase also causes an increase in the basal phosphorylation levels of TAK1, ERK1/2, IKK, and p-IκB, presumably as a result of the lower activity of PP2A. After the addition of LPS, TAK1 and ERK1/2 increase their phosphorylation as a consequence of higher inhibition of PP2A, but this is not observed on IKK and IκB. Together with its role in preformed TNF secretion, Fyn kinase exerts a negative control on LPS-induced TNF mRNA accumulation by an unknown mechanism. In this article, we provide evidence that the tyrosine kinase Fyn is an important effector of TLR4-elicited responses on MCs, controlling the activity of a PP2A–PKCα/β axis necessary for the secretion of TNF by VAMP3+ vesicular carriers in response to LPS. Initially, participation of Tyr kinases in the TLR4-signal transduction system was proposed in studies using peripheral blood monocytes (21). After these initial observations, involvement of Src family kinases (particularly Lyn) in LPS-induced cytokine production was confirmed in monocytes (56), MCs (23), and other immune cells (22), indicating that those proteins are not just incidentally recruited elements but are important regulators of TLR4-dependent responses related to cytokine production in response to innate immunity stimuli (20, 57). In contrast to Lyn, Fyn kinase has primarily been studied in MCs in the context of FcεRI-dependent signaling, where it positively controls degranulation (11) and IgE/Ag-induced TNF and leukotriene production (10). Our results show for the first time, to our knowledge, that this kinase negatively controls TNF production after TLR4 activation in IgE-sensitized BMMCs at different stages, such as secretion from prestored pools, mRNA synthesis, and mRNA stabilization (Fig. 7), suggesting that Fyn kinase plays a role in the limitation and downregulation of cytokine production stimulated by innate immunity receptors. Activation of Fyn kinase usually is associated with the generation of positive signals downstream of a number of multichain immune receptors, such as TCR and FcεRI (7, 58), leading to the activation of NF-κB. However, recent evidence suggested that this kinase also generates negative signals that downregulate T cell and MC activation. For example, treatment of BMMCs with the specific Fyn inhibitor SU6656 or small interfering RNA–mediated knockdown of Fyn leads to increased phosphorylation of AMPK, its upstream kinase LKB1, and its downstream target acetyl–CoA carboxylase in the absence of FcεRI stimulation (59), and Fyn negatively regulates TCR signaling in CD8 T cells (60). Our data add to the notion that Fyn kinase acts as a negative modulator of specific immune responses, limiting, in our particular case, the amount of TLR4-triggered TNF. MCs secrete cytokines by a mechanism controlled by SNARE proteins, and recent evidence showed a differential role for VAMP8 and VAMP3 in anaphylactic secretion stimulated by IgE/Ag complexes. For example, experiments using BMMCs derived from VAMP8−/− mice showed that FcεRI-triggered anaphylactic secretion of the preformed mediator β-hexosaminidase depends on VAMP8 function. In these studies, TNF was associated with VAMP3+ compartments that were observed after treatment with IL-1β (28). Our results are in line with these observations, because, in WT and Fyn−/− BMMCs, TNF was associated with VAMP3+ vesicular carriers; this adds to previous knowledge that LPS induces important translocation and coalescence of VAMP3 (but not VAMP8) at the plasma membrane outside lipid rafts. Translocation of VAMP3 was observed during other cellular events, such as endocytosis, cell migration, and membrane protein trafficking. 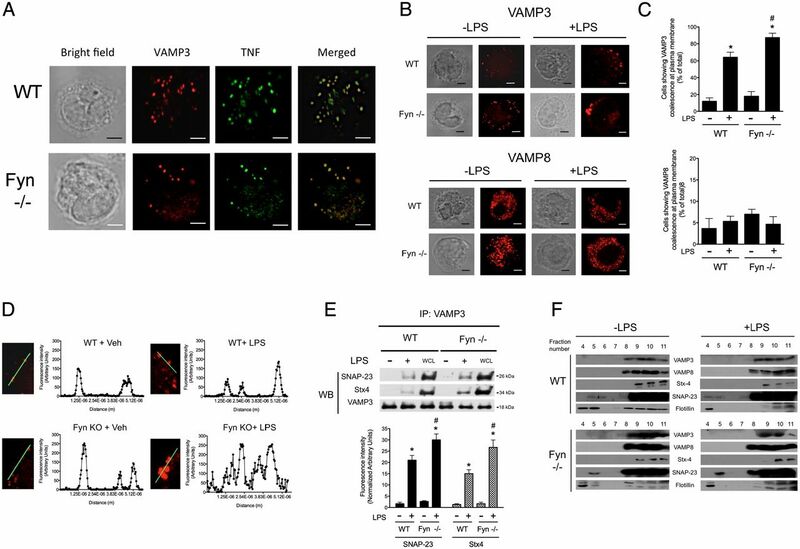 VAMP3 and SNAP-23 contribute to IL-6 and TNF secretion stimulated by IL-1β (61), and recent evidence supports the idea that VAMP3 mediates the secretion of components specifically from the recycling endosomes (62). In macrophages, for example, VAMP3 was found to be a marker of recycling endosomes and was involved in LPS-induced TNF secretion (63). Remarkably, VAMP3 and other proteins of the secretory machinery formed large clusters at the delivery site on the membrane (the phagocytic cup) (63). In our study, the increased number and size of VAMP3 aggregates found on Fyn-deficient cells could indicate an increased fusion rate of VAMP3+ carriers to the plasma membrane. The possible participation of the recycling endosome in TNF secretion in MCs should be examined in future studies. 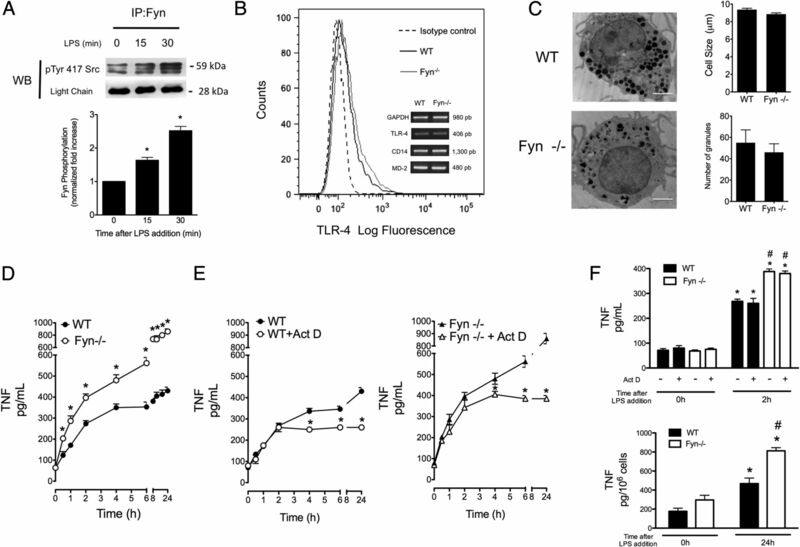 The role of Fyn in LPS-stimulated cells was the modulation of specific events involved in the coupling of TLR4 triggering with preformed TNF secretion and de novo TNF synthesis (Fig. 7). With regard to the rapid secretion from pre-existing stores, our results showing that the inhibition of PP2A with low concentrations of OA improved LPS-induced TNF secretion indicate that PP2A negatively counterbalances positive signals generated by the TLR4 receptor in MCs. Our data are in line with those obtained by Boudreau et al. (64), who demonstrated that phosphatase inhibition potentiates cytokine production in MCs. In those experiments, OA (100 nM) significantly potentiated IL-6 production after Ag-dependent triggering of FcεRI on IgE-sensitized BMMCs. Our observation that OA can potentiate the production of TNF in response to LPS, together with the increase in IL-6 in response to IgE/Ag, suggests that a common step in the TLR4- and FcεRI-signaling systems in MCs is the inhibition of PP2A, a response that could, at least initially, allow a favorable phosphorylation rate of key intracellular effectors. Temporal inhibition of phosphatases to amplify inflammatory signals has been largely described (45). In accordance with the lower basal activity of PP2A observed in Fyn-deficient cells, a number of proteins (including IKK and IκB) were found phosphorylated, and transcription factors were located in the nucleus. However, the amounts of TNF mRNA, intracellular TNF, and TNF secretion in nonstimulated cells were not significantly different from those observed in WT cells. Moreover, the hyperresponsive phenotype was only observed after LPS addition. Although a unique explanation for the phenotype of Fyn BMMCs in basal conditions is not obvious, it is possible to imagine an scenario in which, despite the phosphorylation of key proteins, positive signals generated by TLR4 receptor (and not analyzed in this study) could be necessary to activate the cellular process of TNF secretion and de novo production. For example, activation of the IKK complex requires phosphorylation of key residues on IKKα/β, as well as the polyubiquitination of the regulatory subunit NEMO (65). Also, a number of studies showed that transcriptional control of the TNF gene depends on the translocation of transcription factors (such as NF-κB) and, more importantly, on epigenetic modifications of the TNF/LT locus (66). The possibility that Fyn is involved in the regulation of those protein-ubiquitination or epigenetic changes only after TLR4 triggering is a matter for future studies. However, our data clearly show important negative roles for Fyn in the rapid secretion of TNF and the TNF mRNA degradation rate after LPS addition in MCs. PP2A negatively regulates the activity of many proteins downstream of distinct membrane receptor triggering and is an important modulator of endotoxin tolerance in macrophages, downregulating the activity of the MyD88-dependent signaling pathway (67). Importantly, PP2A seems to participate in a large number of feedback loops in the TLR4 signal-transduction system, controlling, among others, the activity of CamKII (68) and IKK (69). The activity of PP2A is regulated by several posttranslational modifications (44). Notably, the inhibitory effect of phosphorylation on Tyr 307 residue within PP2Ac by Src family kinases was reported in different cell types (45, 70). Our results show a clear increase in basal Tyr 307 phosphorylation in Fyn−/− BMMCs, suggesting that the absence of Fyn increases the activation of the responsible Src family kinase. Interestingly, in this respect, Lyn kinase, which positively controls activation of the TRAF6–TAK1 axis on BMMCs (23), was associated with PP2A after LPS addition in WT cells, and this interaction increased significantly in the absence of Fyn. Our data add to the described positive role for Lyn, extending its function to the inactivation of PP2A and showing for the first time, to our knowledge, that Fyn kinase negatively regulates this interaction. The relationship among Src family kinases, PP2A inactivation, and function of the TRAF6/TAK1 module of TLR4 signaling is under investigation. Because PP2A activation is involved in the control of PKCα/β activity after TLR triggering (48), it was not unexpected to find phosphorylated classical isoforms of PKC in Fyn−/− cells. However, this phosphorylation was not related to a significant constitutive association of VAMP3 with SNAP-23 and Stx4 or to TNF secretion on that cell type. However, LPS addition to those cells caused the dissociation of PKCα/β from PP2A and its corresponding association with the adapter protein AHNAK. AHNAK is a high m.w. protein with scaffolding functions that is involved in a range of processes, such as cell architecture and migration, modulation of calcium channels, and membrane repair (71). This protein also promotes the dissociation of PKC from PP2A and increases PKCα activity in NIH3T3 cells (52). AHNAK is highly expressed in MCs and is significantly phosphorylated in response to FcεRI cross-linking (72). In lymphocytes, this adapter is an essential component of the machinery involved in calcium entry through l-type calcium channels, leading to IL-2 production (73). To our knowledge, our finding that AHNAK associates with PKCα/β in response to LPS stimulation provides, for the first time, evidence of the participation of this molecule in the signal transduction of the TLR4 receptor and adds to the description of the role of this polypeptide in the control of immune cell activity, although its specific function remains to be explored. The activation of PKCα/β in immune cells shows a clear link with the production of cytokines after TLR activation. For example, pretreatment of neutrophils with Gö6976 decreased the production of TNF after the addition of TLR4 or TLR2 ligands (48). Our data now show that PKCα/β is necessary for the membrane coalescence of VAMP3+ vesicular carriers involved in TNF secretion in MCs (Fig. 7). Further investigations will be necessary to investigate the possible connections between PKC activation and transport of vesicular carriers. In murine models of infection with Gram-negative bacteria, TLR4-dependent TNF production was shown to be protective against enterobacterial infections (74), although this can also contribute to the generalized damage during high-intensity infections (55). Consistent with our in vitro results, we observed increased TNF secretion in Fyn−/− mice and WshRecFyn−/− mice after i.p. LPS administration, indicating that Fyn also negatively controls MC-derived TNF production in response to bacterial ligands in vivo. This observation supports other studies in which an inhibitory role for Fyn kinase in physiological responses was described, such as AMPK activity, insulin sensitivity, and energy consumption (75) in whole animals, and it adds to the description of the role of Src family tyrosine kinases in innate immune responses. We thank Jaime Escobar Hernández (Cell Biology Department, Cinvestav) and Iván Galván Mendoza and María de Lourdes Rojas (Laboratory of Electronic Nanoscopy, Cinvestav) for laser confocal and electronic microscopy images. We also thank Dr. Jorge Fernández Hernández, Benjamín E. Chávez Álvarez, Rafael Leyva Muñoz, María Antonieta López López, Ricardo Glaxiola Centeno, and Víctor Manuel García Gómez (Unit for the Production and Experimentation of Laboratory Animals, Cinvestav) and Dr. J. Adolfo García Sáinz, Dr. María Teresa Romero, and Biologist Marcela Sosa Garrocho (Cellular Physiology Institute, National Autonomous University of Mexico), for technical support and for supplying important reagents. This work was supported by an international collaboration grant between Consejo Nacional de Ciencia y Tecnología México (Conacyt) (Conacyt-ANR188565) and Agence Nationale de la Recherche France (ANR-12-ISV3-0006-01) and scholarship 404373 from Conacyt (to J.I.C.-A.).
. 2013. Innate immunity and its regulation by mast cells. J. Immunol. 190: 4458–4463.
. 2011. Mast cells as cellular sensors in inflammation and immunity. Front. Immunol. 2: 37.
. 2014. Mast cell mediators: their differential release and the secretory pathways involved. Front. Immunol. 5: 569.
. 2014. Mast cell secretory granules: armed for battle. Nat. Rev. Immunol. 14: 478–494.
. 2004. The ins and outs of IgE-dependent mast-cell exocytosis. Trends Immunol. 25: 266–273. 2011. Immunoglobulin E receptor signaling and asthma. J. Biol. Chem. 286: 32891–32897.
. 2009. 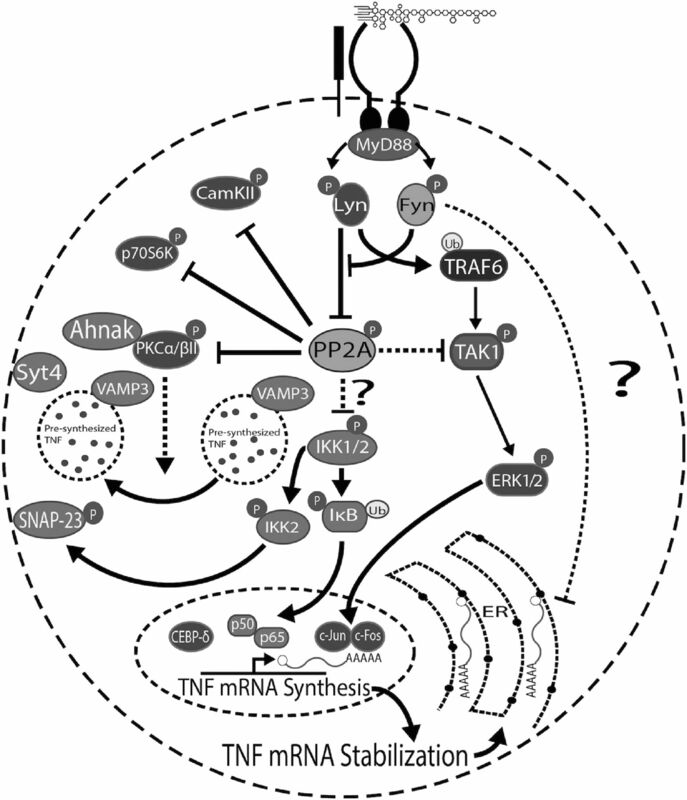 The tyrosine kinase network regulating mast cell activation. Immunol. Rev. 228: 149–169.
. 2004. Negative regulation of immunoglobulin E-dependent allergic responses by Lyn kinase. J. Exp. Med. 199: 1491–1502.
. 2010. Functional analysis of Lyn kinase A and B isoforms reveals redundant and distinct roles in Fc epsilon RI-dependent mast cell activation. J. Immunol. 184: 5000–5008.
. 2005. Impaired FcepsilonRI-dependent gene expression and defective eicosanoid and cytokine production as a consequence of Fyn deficiency in mast cells. J. Immunol. 175: 7602–7610.
. 2002. Fyn kinase initiates complementary signals required for IgE-dependent mast cell degranulation. Nat. Immunol. 3: 741–748. Staser, K., M. A. Shew, E. G. Michels, M. M. Mwanthi, F. C. Yang, D. W. Clapp, and S. J. Park. 2013. A Pak1-PP2A-ERM signaling axis mediates F-actin rearrangement and degranulation in mast cells. Exp. Hematol. 41: 56–66.e2. doi:10.1016/j.exphem.2012.10.001.
. 2011. Deficiency of SHP1 leads to sustained and increased ERK activation in mast cells, thereby inhibiting IL-3-dependent proliferation and cell death. Mol. Immunol. 48: 472–480.
. 2014. Mast cell activation: a complex interplay of positive and negative signaling pathways. Eur. J. Immunol. 44: 2558–2566.
. 2012. TLR signaling in mast cells: common and unique features. Front. Immunol. 3: 185.
. 2011. Signaling through Toll-like receptor 4 and mast cell-dependent innate immunity responses. IUBMB Life 63: 873–880.
. 2011. Absence of TRIF signaling in lipopolysaccharide-stimulated murine mast cells. J. Immunol. 186: 5478–5488.
. 2007. Role of TLR4 tyrosine phosphorylation in signal transduction and endotoxin tolerance. J. Biol. Chem. 282: 16042–16053.
. 1993. Lipopolysaccharide induces activation of CD14-associated protein tyrosine kinase p53/56lyn. J. Biol. Chem. 268: 20725–20728.
. 2014. Tyrosine phosphorylation in Toll-like receptor signaling. Cytokine Growth Factor Rev. 25: 533–541.
. 2012. Lyn kinase controls TLR4-dependent IKK and MAPK activation modulating the activity of TRAF-6/TAK-1 protein complex in mast cells. Innate Immun. 18: 648–660.
. 2014. Munc18-2 and syntaxin 3 control distinct essential steps in mast cell degranulation. J. Immunol. 192: 41–51.
. 2014. Vesicular trafficking and signaling for cytokine and chemokine secretion in mast cells. Front. Immunol. 5: 453.
. 2000. Soluble NSF attachment protein receptors (SNAREs) in RBL-2H3 mast cells: functional role of syntaxin 4 in exocytosis and identification of a vesicle-associated membrane protein 8-containing secretory compartment. J. Immunol. 164: 5850–5857.
. 2008. Mast cells possess distinct secretory granule subsets whose exocytosis is regulated by different SNARE isoforms. Proc. Natl. Acad. Sci. USA 105: 2580–2585.
. 2008. VAMP-8 segregates mast cell-preformed mediator exocytosis from cytokine trafficking pathways. Blood 111: 3665–3674.
. 2009. Increased formation of VAMP-3-containing SNARE complexes in mast cells from VAMP-8 deficient cells. appetite. Inflamm. Res. 58(Suppl. 1): 13–14. Ping-Chang, Y., Z. Peng-Yuan, and W. Chang-Sheng. 2004. Lipopolysaccharide activates human mast cells to induce intestinal epithelial barrier dysfunction. The Internet Journal of Gastroenterology 4. Available at: http://print.ispub.com/api/0/ispub-article/3512.
. 2013. Morphine prevents lipopolysaccharide-induced TNF secretion in mast cells blocking IκB kinase activation and SNAP-23 phosphorylation: correlation with the formation of a β-arrestin/TRAF6 complex. J. Immunol. 191: 3400–3409.
. 2001. Vav1 regulates phospholipase cgamma activation and calcium responses in mast cells. Mol. Cell. Biol. 21: 3763–3774.
. 2011. IgE-dependent sensitization increases responsiveness to LPS but does not modify development of endotoxin tolerance in mast cells. Inflamm. Res. 60: 19–27.
. 2006. Toll-like receptors TLR2 and TLR4 initiate the innate immune response of the renal tubular epithelium to bacterial products. Clin. Exp. Immunol. 145: 346–356.
. 2004. MD-2 is required for the full responsiveness of mast cells to LPS but not to PGN. Biochem. Biophys. Res. Commun. 323: 491–498.
. 1992. Transfection of CD14 into 70Z/3 cells dramatically enhances the sensitivity to complexes of lipopolysaccharide (LPS) and LPS binding protein. J. Exp. Med. 175: 1697–1705.
. 2003. Raft-mediated trafficking of apical resident proteins occurs in both direct and transcytotic pathways in polarized hepatic cells: role of distinct lipid microdomains. Mol. Biol. Cell 14: 611–624.
. 2015. Novel regulation of Ski protein stability and endosomal sorting by actin cytoskeleton dynamics in hepatocytes. J. Biol. Chem. 290: 4487–4499.
. 2005. Mast cell-deficient W-sash c-kit mutant Kit W-sh/W-sh mice as a model for investigating mast cell biology in vivo. Am. J. Pathol. 167: 835–848.
. 2011. Morphine decreases early peritoneal innate immunity responses in Swiss-Webster and C57BL6/J mice through the inhibition of mast cell TNF-α release. J. Neuroimmunol. 232: 101–107.
. 2006. Cytokine secretion via cholesterol-rich lipid raft-associated SNAREs at the phagocytic cup. J. Biol. Chem. 281: 11949–11954.
. 2006. Mast cell function: regulation of degranulation by serine/threonine phosphatases. Pharmacol. Ther. 112: 425–439.
. 2013. Phosphatase: PP2A structural importance, regulation and its aberrant expression in cancer. Cancer Lett. 335: 9–18.
. 1995. Activation of protein kinases and the inactivation of protein phosphatase 2A in tumour necrosis factor and interleukin-1 signal-transduction pathways. Eur. J. Biochem. 229: 503–511.
. 1999. Regulation of protein kinase cascades by protein phosphatase 2A. Trends Biochem. Sci. 24: 186–191.
. 2006. The Bcl10-Malt1 complex segregates Fc epsilon RI-mediated nuclear factor kappa B activation and cytokine production from mast cell degranulation. J. Exp. Med. 203: 337–347.
. 2005. Involvement of PKCalpha/beta in TLR4 and TLR2 dependent activation of NF-kappaB. Cell. Signal. 17: 385–394.
. 2002. Protein phosphatase 2A and protein kinase Calpha are physically associated and are involved in Pseudomonas aeruginosa–induced interleukin 6 production by mast cells. J. Biol. Chem. 277: 5322–5329.
. 2010. PKC and the control of localized signal dynamics. Nat. Rev. Mol. Cell Biol. 11: 103–112. 2015. Dynamics and Membrane Interactions of Protein Kinase C. Biochemistry 54: 4953–4968.
. 2008. Ahnak protein activates protein kinase C (PKC) through dissociation of the PKC-protein phosphatase 2A complex. J. Biol. Chem. 283: 6312–6320.
. 1996. Critical protective role of mast cells in a model of acute septic peritonitis. Nature 381: 75–77.
. 2005. Animal models of sepsis: setting the stage. Nat. Rev. Drug Discov. 4: 854–865.
. 2010. Mast cell-derived TNF can exacerbate mortality during severe bacterial infections in C57BL/6-KitW-sh/W-sh mice. Am. J. Pathol. 176: 926–938.
. 1996. Bacterial lipopolysaccharide induces the association and coordinate activation of p53/56lyn and phosphatidylinositol 3-kinase in human monocytes. J. Immunol. 156: 1157–1165.
. 2015. Co-operation of TLR4 and raft proteins in LPS-induced pro-inflammatory signaling. Cell. Mol. Life Sci. 72: 557–581. Hwang, S. L., Li, X., Lu, Y., Jin, Y., Jeong, Y. T., Kim, Y. D., Lee, I. K., Taketomi, Y., Sato, H., Cho, Y. S., Murakami, M., Chang, H. W. 2013. AMP-activated protein kinase negatively regulates FcεRI-mediated mast cell signaling and anaphylaxis in mice. J. Allergy Clin. Immunol. 132: 729–736.e12.
. 2007. Fyn regulates the duration of TCR engagement needed for commitment to effector function. J. Immunol. 179: 4635–4644.
. 2014. SNAP-23 and VAMP-3 contribute to the release of IL-6 and TNFα from a human synovial sarcoma cell line. FEBS J. 281: 750–765.
. 2011. Transport of the major myelin proteolipid protein is directed by VAMP3 and VAMP7. J. Neurosci. 31: 5659–5672.
. 2005. A role for the phagosome in cytokine secretion. Science 310: 1492–1495.
. 2004. Phosphatase inhibition potentiates IL-6 production by mast cells in response to FcepsilonRI-mediated activation: involvement of p38 MAPK. J. Leukoc. Biol. 76: 1075–1081. 2010. The IKK complex, a central regulator of NF-kappaB activation. Cold Spring Harb. Perspect. Biol. 2: a000158.
. 2013. Epigenetic control of cytokine gene expression: regulation of the TNF/LT locus and T helper cell differentiation. Adv. Immunol. 118: 37–128.
. 2013. Protein phosphatase 2A catalytic subunit α plays a MyD88-dependent, central role in the gene-specific regulation of endotoxin tolerance. Cell Reports 3: 678–688.
. 2014. Comprehensive logic based analyses of Toll-like receptor 4 signal transduction pathway. PLoS One 9: e92481.
. 1997. A cytokine-responsive IkappaB kinase that activates the transcription factor NF-kappaB. Nature 388: 548–554.
. 1992. Regulation of protein serine-threonine phosphatase type-2A by tyrosine phosphorylation. Science 257: 1261–1264.
. 2014. AHNAK: the giant jack of all trades. [Published erratum appears in 2015 Cell Signal 27: 187–188.] Cell. Signal. 26: 2683–2693.
. 2007. Quantitative time-resolved phosphoproteomic analysis of mast cell signaling. J. Immunol. 179: 5864–5876.
. 2008. A scaffold protein, AHNAK1, is required for calcium signaling during T cell activation. Immunity 28: 64–74.
. 2001. Protective roles of mast cells against enterobacterial infection are mediated by Toll-like receptor 4. J. Immunol. 167: 2250–2256.
. 2007. Integrative metabolic regulation of peripheral tissue fatty acid oxidation by the SRC kinase family member Fyn. Cell Metab. 5: 371–381.